Yume Hasegawa has a secret: She's a monster and her brother Utsutsu discovered this the hard way. 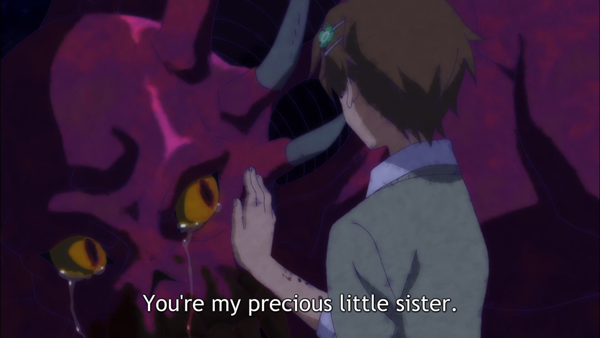 He learned this so hard, in fact, that monster Yume ended up biting Utsutsu and turned him into a monster as well. The two are very dangerous and have the ability to regenerate. Now the siblings are on the run from an organization hell bent on capturing them. On the surface, this sounds like a simple monster running from powerful people story, but it's much worse than that. But we'll get to that in a little bit. One of the biggest problems this show had was its original broadcast version, which also aired on Crunchyroll. The broadcast version of the show very was heavily censored. Anything related to blood or gore was either blacked out or whited out to make sure you say very little red. Hilariously, this caused situations where you had no idea what’s going on and actually make some situations look worse than they were. Seriously, the censorship is out of control with the series. 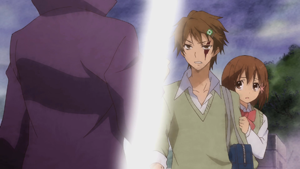 What's the point of censoring the knife when you show it anyway in the very next shot?! Despite everything I’ve said so far, by far the worst aspect of the show is the story. You see, Pupa was originally going to air in the Fall of 2013 but got pushed back to the Winter of 2014. The prevailing rumor about the show is that Pupa was supposed to be a full length series with 30 minute episodes, but something went horribly wrong behind the scenes and the show got cut down to a 5 minute series. After watching the show, it looks like that's exactly what happened. The story is so disjointed. There is no natural flow between episodes and the overall plot is has many holes in. 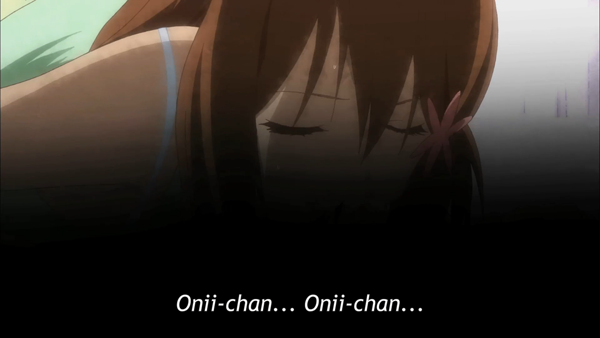 Hell, there’s an entire episode that’s just Yumi saying “Onii-chan” over and over again while eating. THAT’S IT! That’s the whole episode! The series feels like the scraps of a two part series premiere. Nothing really got accomplished in the end and there was no sense of finality. Furthermore, according to some people who read the manga, one of the episodes never happened in the source material and was there just to show a woman bathing. Are you serious? You had so little time to begin with, but actually decided to put some filler into the show. But what’s even more amazing is that the final episode has absolutely NOTHING to do with the rest of the series! It has nothing to do with the plot at all. You could not watch it and miss 0% of the story. This show is an amazing train wreck. 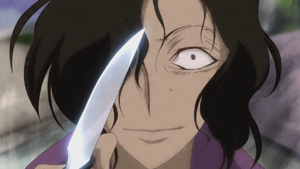 I've seen people say that Pupa is the worst anime they’ve ever seen. Personally, I disagree. It’s not even the worst anime I’ve reviewed for this site. I actually found Pupa to be an amazing show to watch for all the wrong reasons. As I was watching, I could just see so many things go wrong with this show, I just found it fascinating. I would love to hear what happened behind the scenes because the show looks like a lost cause that was released purely to recoup losses. 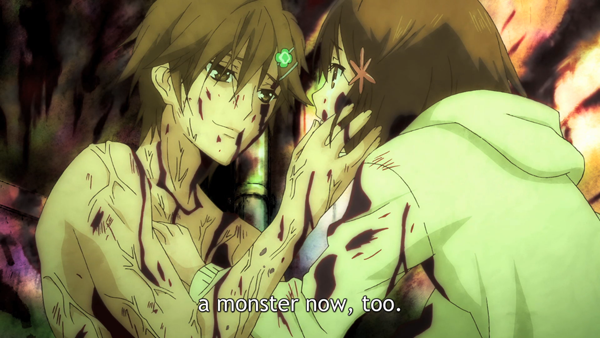 If you want to see how badly a show can go wrong, watch Pupa. However, if you want to watch a genuinely good horror anime, stay far, far away. Because it has no redeeming value whatsoever. Pupa is no longer available for legal streaming as of December 2014.